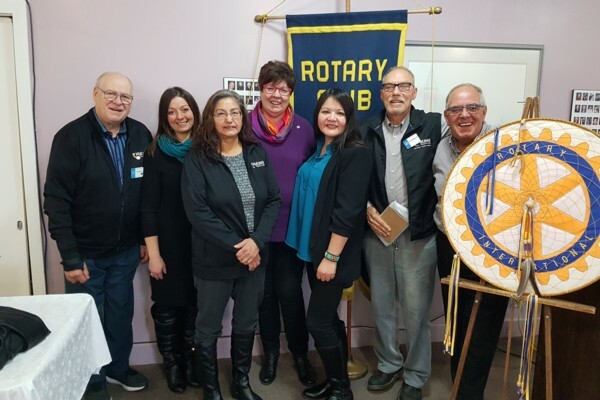 At its October 16th meeting, the Rotary Club of Bowmanville had the pleasure of hosting representatives from the Matawa First Nations Education Department who visited from Thunder Bay to update the Club on its achievements and the disbursement of the bursaries provided by the Club. Education Manager Sharon Nate gave the Club a presentation related to the bursaries and to the on-going challenges they face and successes they have achieved. Also participating in a question and answer session were Post Secondary Coordinator Georgette O'Nabigon and Junior Lead Kelly Soulias. Initiated ten years ago by Bowmanville Rotarians Ted Mann and Doug Park, the Bowmanville Rotary Club has been privileged to provide over $80,000 in bursaries to help support the vision, mission and goals of Matawa First Nations education programs. Lead by Georg Krohn, Renee Bos, and Fred Mandryk, Bowmanville Rotarians continue to support the original vision of the relationship and look forward to a long and lasting friendship with Matawa First Nations.